No matter the cost, I've never allowed myself to feel guilty about buying a book (my bank account might say otherwise, because my room is quite literally filled with them). I'm a true lover of books - I give them for gifts, I hoard them endlessly and I've been known to spend hours holed up inside any given Half Price Books. In the midst of all this chaos, I've stumbled upon some truly incredible reads. 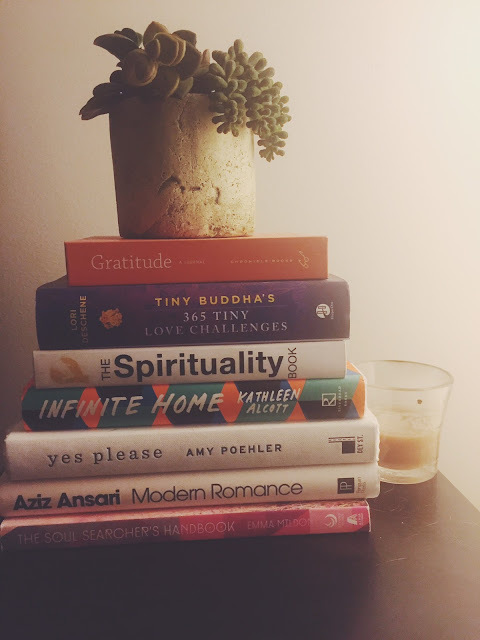 Books that have opened my heart, enlightened my mind and reinvigorated my spirit. I even laughed. Gratitude: A Journal by Catherine Price: This is a journal more so than a book. This journal encourages you to keep a daily record of the small, sweet things in life. It's filled with a year's worth of insightful prompts, quotes and room to reflect on the day to day things that make you happy and grateful. Tiny Buddha's 365 Tiny Love Challenges: OK you got me, this is kind of a journal, too. This book was created by the founder of the only community TinyBuddha.com (popular online community focusing on gratitude and happiness). Each week begins with an inspirational message written by members of the online community, followed by seven days of short challenges that focus on self-live, giving and receiving. It's a subtle daily reminder that even during life's challenges, there is always love to be given and shared. The Spirituality Book: I grabbed this book on sale at Urban Outfitters around the holidays. I actually don't know where you can pick it up now, but I'm so excited to dive into book. I love the idea of diving into big topics like spirituality, and I'm excited to broaden my knowledge and learn more about spirituality as a whole, as well as what I truly believe. It'll be a good Saturday night read. With a lot of wine. Infinite Home by Kathleen Alcott: The cover and title drew me into this book, and after reading the book summary, I'm not sure I could have found a more perfect book for this time in my life. "Edith is a widowed landlady who rents apartments in her Brooklyn brownstone to an unlikely collection of humans, all deeply in need of shelter. Crippled in varous ways - in spirit, in mind, in body, in heart - the renters struggle to navigate daily existence, and soon come to realize that Edith's deteriorating mind, and the menacing presence of her estranged, unscrupulous son Owen, is the greatest challenge they must confront together." YES. My heart needs this. Yes Please by Amy Poehler: This book needs no explanation. A strong, funny lady who challenges social norms and manages to achieve her dreams and conquer a divorce and raise a family? Amy, you are everything. Modern Romance by Aziz Ansari: I picked this book up at Target the day after the breakup, and I couldn't believe what happened - I actually laughed. 24 hours after having my heart smashed. Only Aziz can do that. The Soul Searcher's Handbook: A Modern Girl's Guide to the New Age World by Emma Mildon: This book is for the spiritual seeker, and I'm looking for guidance right now.This book offers tips, tricks and how-to's for incorporating everything from aromatherapy, numerology, healing crystals, meditation, astrology, dreamology, mysticism and more into your every day life. I'm halfway through and can't put it down.